As part of an investigation launched by Başsavcıvekilliği in Ankara on March 20 arrested seven people, including college students. 13 of the indictment prepared by the prosecutor's office in Ankara Was adopted by the High Criminal Court. The suspects include three held under arrest - Duygu Kerimoğlu, Alaattin Karagenç and Uğur Cihan Oktulmuş, under arrest for the past seven months. The suspects stand accused of membership in an armed terrorist organization, illegally obtaining confidential documents and personal information and accessing information systems without permission. "Hierarchical and structured in order to be organized as a terrorist organization, titling, and posting bills realized by events, actions, photographs published on the internet, attacked and seized actions that interfere with the information and documents published on the web site, they have established the definition of the organization's web sites ..."
"Perform actions on the Internet as they structure TPLP / C, THKO the TKP / ML, DHKP / C, MLCP and the Marxist-Leninist-Maoist left as the PKK separatist terrorist organizations and their digital support, in this sense Kızılyıldızlar RedHack member of the group of persons, other even if they are not members of illegal organizations, members who commit crimes on behalf of the organization in which the determined position. " 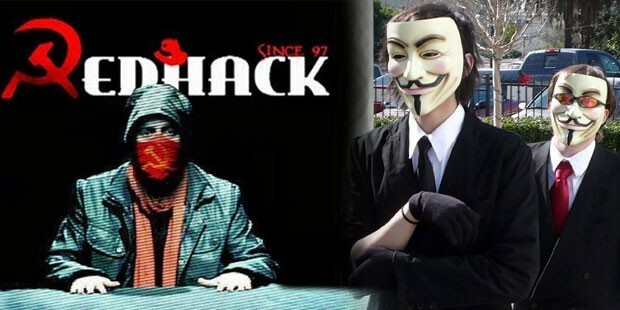 RedHack, which is affiliated with the international hacking group Anonymous, had earlier attacked websites belonging to the Turkish Football Federation (TFF), the National Intelligence Organization (MİT), the Scientific and Technological Research Council of Turkey (TÜBİTAK), the Land Forces Command, the Air Forces Command, Turkish telecommunications mega-corporation Türk Telekom and a number of other institutions.